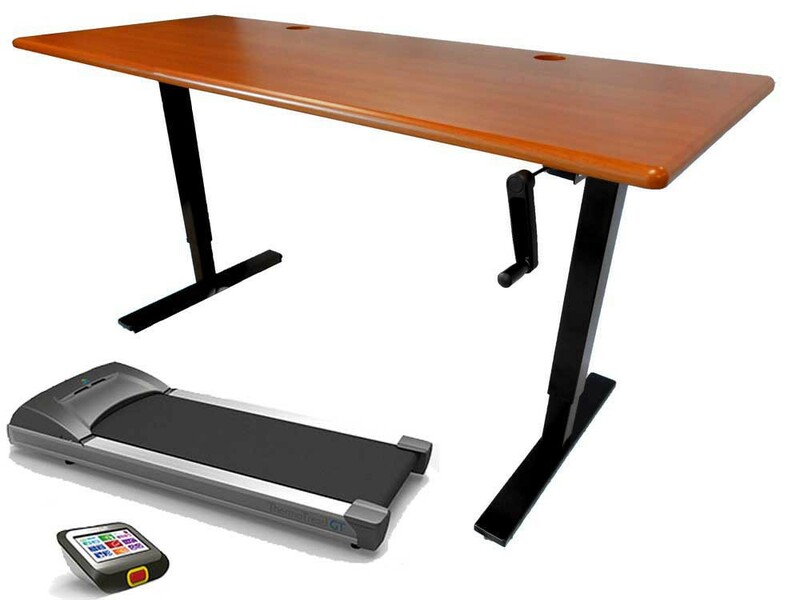 Despite the incredible variety of electric desks on the market, manual-adjustment desks remain popular among treadmill deskers. Why? A low price tag attracts prospective walkers on a budget, while others simply prefer an unpowered option – one that can't leech energy or add another cable to the tangle. The ThermoDesk Elemental is our current pick of the category, and comes highly recommended to anyone on the hunt for a budget - and space - friendly treadmill desk. Crank desks come in considerably cheaper than their motorized cousins. What little they lack in speed they make up for by being quiet, cordless adjusters. ThermoDesk Elementals are the pick of the litter, and would fit perfectly into a budget treadmill desk. Anyone dealing with extremely limited office space should also appreciate the petite 40” wide option. 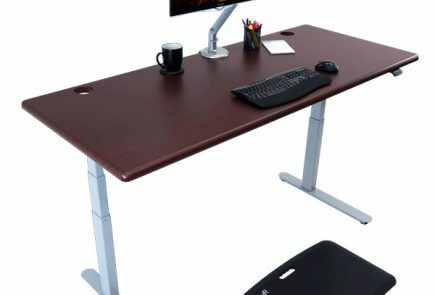 Anyone searching for a full sit-walk desk should turn to the extra-wide Electra and Elite electric desks, also by iMovR. Crank desks also don't fare well in shared workstations, as they lack the helpful height presets found on high-end electric desks. Also not a good choice for anyone extremely averse to manual labor. If you're on the hunt for an economy desk and don't mind trimming a few premium features, the Elemental is definitely for you. While we like the advanced features of the other iMovR desks, many buyers will find they need look no higher than this slick little manual desk. Anyone budgeting either money or space will find the Elemental a welcome addition to the office. They pair well with any walking treadmill – we recommend our Editors' Picks, the Lifespan TR1200-DT3 or TR5000-DT3. We've also had users pair small Elemental tables with TR800-DT3 treadmills, the smallest option offered by Lifespan, for a truly space-saving walking desk. We’re extremely fond of the Elite and the Electra, iMovR’s electric, extra-large desk lines. Both are capable of stretching to accommodate a chair and treadmill side by side for a sit-walk setup. 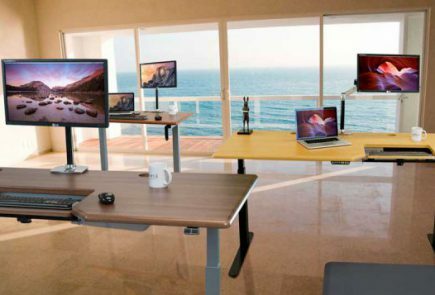 These workstations are ergonomically ideal, and come heavily recommended – if you’ve got the room to fit them. Sit-walk desks don’t get along well with cramped offices. The smallest width needed for one is 72”, a pretty serious space investment. So what’s a real estate-challenged desker to do? The only real option is to set up a stand-walk desk, and fit sitting in where you can. Either maintain a fixed-height desk specifically for chair time, or find a belt-friendly chair you can perch directly on top of your treadmill (Mogo leaning chairs work great). But electric desks can still cause problems even at smaller sizes. Elemental and Electra desks are hefty pieces of hardware, and squishing one into a study nook or cubicle isn’t our idea of a good time. On top of that, their smallest size is still a spacious 48”x30”. Elementals are considerably lighter, and can come with tabletops as slim as 40”x24”. Not only that, but going manual removes the necessity of plugging in. You’ll still need to find an outlet for your treadmill, but taking the desk out of the electrical equation cuts down cable snarl and makes positioning the Elemental a much easier experience. Anyone aching for a simpler desk should give the Elemental a thought. Keep this in mind though: it’s not necessarily the ideal desk for a multi-user workstation. The Elemental’s manual adjustment system is fast and easy to use, but can’t match the convenience of the Electra or Elite’s motorized movement. On top of that, crank desks lack the height presets that make upscale electric desks – like the Elite – so perfect for shared workstations. It’s also worth noting that Elementals do not have the desktop power station option that their electric cousin do. Elemental tabletops come without grommet holes, and consequently cannot accommodate grommet-mounted outlets. On the other hand, they are designed to easily mount the iMovR Stowaway keyboard tray. A set of pre-drilled pilot holes make it easy to attach one of these forearm-saving peripherals on the underside of an Elemental tabletop. 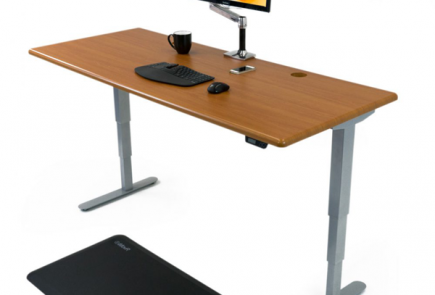 For more information about the ThermoDesk Elemental Adjustable Height Desk – including sizes, colors, warranty, delivery upgrades, and shipping information – check out WorkWhileWalking’s store.